We have this interesting expression in English that when you are through something harrowing, you are out of the woods. The woods are where danger lives and where survival is anybody’s guess. This morning I was reminded that the woods can also be the earth’s womb; a place where the elements of the body resonate with some almost forgotten familiarity; the woods are home. And so while it is sometimes a wonderful thing to find yourself in a clearing, you may also find yourself fortunate to be in the woods. I spent an hour with myself running mossy hilly trails, watching the woods on the cusp of spring. Tiny buds, baby cones, and hairy neon lichen at every turn. I thought about a lot of things, especially marathon training. I thought about my body and how far I’ve come. I thought about the seasons changing and how I am days away from completing my first winter of running regularly and completely outdoors. And then the best part was when I thought about nothing and did not notice the switchbacks until I was up the hill. It takes a bit more time, but I am glad I went in the woods today. I’d like to make it there more often. 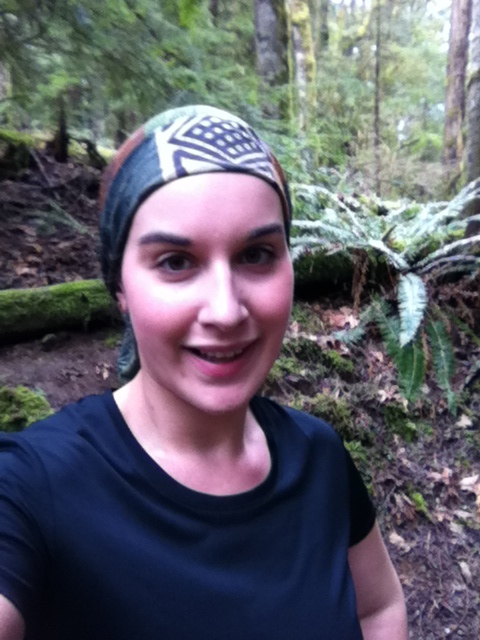 Feeling like a new lady after a rockin’ trail run!